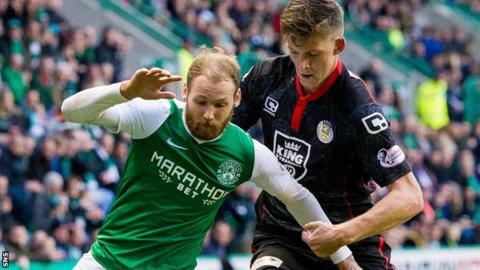 Hibernian made it two wins in a row with a clinical performance against bottom of the table St Mirren to stay three points clear at the top. Martin Boyle scored the opener early on for the Championship leaders with Grant Holt sealing the win before half-time. Jamie Langfield saved a second-half penalty from Holt, but that was about the only positive aspect for the Paisley outfit. They are now three points behind Dumbarton at the bottom of the table. The decision by Hibs manager Neil Lennon to start with Boyle ahead of top scorer Jason Cummings - who remained on the bench for the second week running - proved to be the catalyst for the hosts' victory. The former Dundee winger showed electric pace throughout the afternoon with three Saints defenders often trailing in his wake. The opener arrived after just eight minutes with Andrew Shinnie's inch-perfect pass to Boyle, who showed excellent composure to clip the ball over the advancing Langfield. Ryan Hardie came close to an equaliser for Saints but his effort was cleared off the line by John McGinn, with David Clarkson firing the rebound just wide. The home side doubled their advantage before the break after a sustained spell of pressure. With the Buddies' defence failing to clear their 18-yard box, Boyle nodded the ball back to Holt, who fired home from 16 yards. With 15 minutes of the match remaining, Hibernian could have made it three when Holt was bustled to the ground by Gary Irvine just yards from goal and referee Don Robertson pointed to the spot. But Langfield dived low to his left-hand side to tip Holt's spot-kick away. While Lennon could take satisfaction in a clean sheet and a job well done, St Mirren boss Jack Ross is still looking for his first win - and first goals - since succeeding Alex Rae. Hibs boss Neil Lennon: "That was excellent. Off the back of an excellent win last week, I can't ask any more of the players. It could have been a lot more. "Our play was good. Martin (Boyle) came in and gave us a little bit of zip in attack. He had an outstanding game and scored a great goal. But all round I am very happy. "I toyed with the idea of starting Jason (Cummings) because he is a bona fida centre forward. We see Martin as more of a central player now rather than being a wide man. He has goals in him. "When you see his work rate, when you see a centre forward lead from the front, it gives the whole team a lift." St Mirren boss Jack Ross: "They are top of the league for a reason. They are a good side. I thought in the early part of the game we had good opportunities to take the lead and if you take them the game could pan out differently. "There are encouraging signs. I think the last two games there have been more positives than negatives. "What we are trying to do day in, day out is remind them they are good players and keep working with them. We are heading in the right direction but we need results to equate to that as well." Match ends, Hibernian 2, St. Mirren 0. Second Half ends, Hibernian 2, St. Mirren 0. Attempt missed. Kyle Magennis (St. Mirren) right footed shot from outside the box misses to the left. Substitution, Hibernian. Alex Harris replaces Martin Boyle. Lawrence Shankland (St. Mirren) is shown the yellow card for a bad foul. Kyle Magennis (St. Mirren) wins a free kick on the left wing. Liam Fontaine (Hibernian) wins a free kick in the defensive half. Attempt saved. Brian Graham (Hibernian) right footed shot from outside the box is saved in the centre of the goal. Substitution, Hibernian. Brian Graham replaces Grant Holt. Attempt saved. Andrew Shinnie (Hibernian) right footed shot from outside the box is saved in the centre of the goal. Attempt saved. Jason Naismith (St. Mirren) right footed shot from long range on the right is saved in the centre of the goal. Calum Gallagher (St. Mirren) wins a free kick on the left wing. Attempt saved. Andrew Shinnie (Hibernian) right footed shot from the centre of the box is saved in the centre of the goal. Foul by Ben Gordon (St. Mirren). Substitution, St. Mirren. Calum Gallagher replaces Kyle Hutton. Substitution, Hibernian. Marvin Bartley replaces John McGinn because of an injury. Delay in match John McGinn (Hibernian) because of an injury. Penalty saved! Grant Holt (Hibernian) fails to capitalise on this great opportunity, right footed shot saved in the bottom left corner. Gary Irvine (St. Mirren) is shown the yellow card for a bad foul. Penalty Hibernian. Grant Holt draws a foul in the penalty area. Penalty conceded by Gary Irvine (St. Mirren) after a foul in the penalty area. Corner, St. Mirren. Conceded by Liam Fontaine.